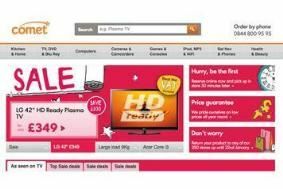 HOT DEALS: Save up to £400 on flatscreen TVs in the Comet sale | What Hi-Fi? You'll find even more TV bargains here, plus a Philips BDP3000 Blu-ray player for £99.99 (save £30) and the Award-winning Sony BDV-E370 Blu-ray 5.1 cinema system for £299.99 (save £150). There are plenty of additional home cinema system deals on the Comet website. Check it out.